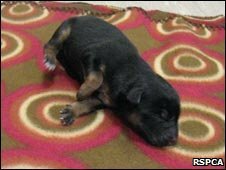 Four newborn puppies have been found dumped in a bin bag weighted down with a paving slab on a frozen canal. Firefighters were called to the canal near Chippingham Street in Sheffield after the puppies were spotted about 20ft (6m) from the side of the bank. The animals survived because the bag did not break through the ice into the water below. The RSPCA said the animals were no more than four days old and urged anyone with information to contact them. Chris Lally, of South Yorkshire Fire and Rescue Service, said: "The puppies were so small they could fit in the palm of our hands. They were obviously extremely cold and we did our best to keep them warm until they were taken by the RSPCA officers to be checked over by vets." Matt Bell, RSPCA chief inspector for South Yorkshire, said: "This was a horrendous act of cruelty against four tiny puppies and we're urging anyone who can help us find the person responsible to get in touch. "These puppies were treated in the most callous way, thrown into the river in a black bin liner, weighted down with a paving slab. It was just fortunate that the ice held otherwise they'd have died. "We're also very concerned for the welfare of the mother who will more than likely be full of milk and at risk of mastitis due to the puppies being suddenly removed."